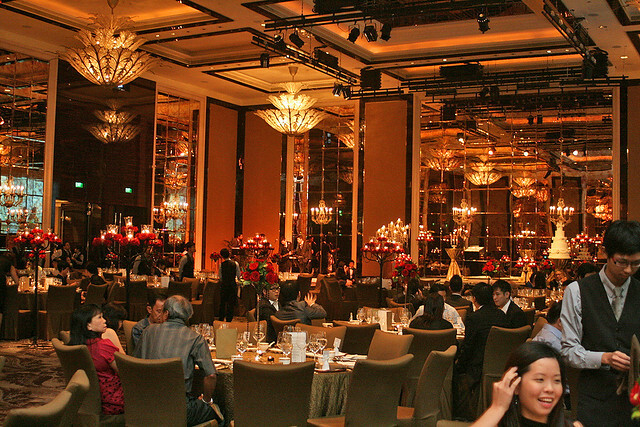 I can now say I have been to a wedding at the famously posh St Regis Singapore. It was a classy event at the stunningly beautiful John Jacob Ballroom. Before you enter the ballroom, there is a little foyer where guests can mingle during the reception and registration. 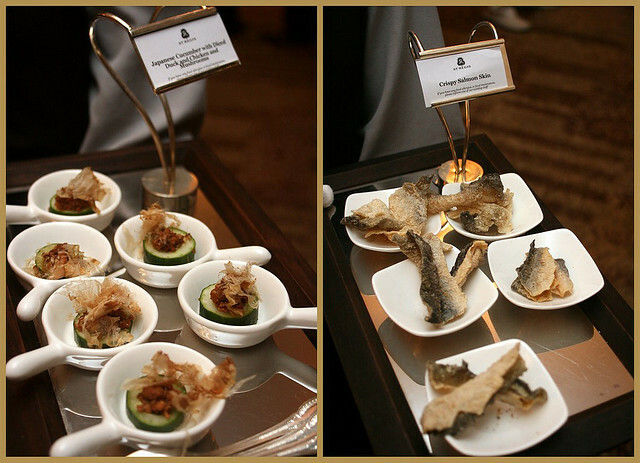 The hotel served tasty little hor d'oeuvres and drinks. Service in general was pretty good throughout the evening. 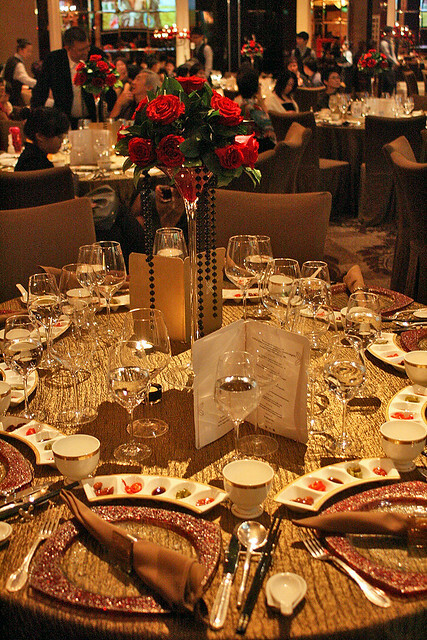 The table setting is so grand. I did wonder briefly how they were going to place dishes in the centre (you know how it is with Chinese wedding dinners). Then I realised we would be served individual portions, Western fine-dining style. But the fare is decidedly Chinese. 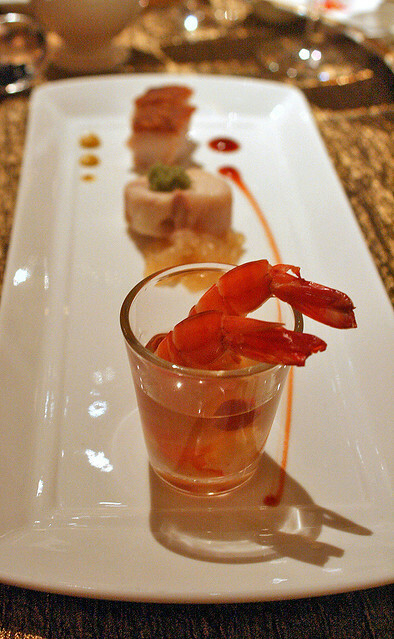 Three Treasure Combinations - Crispy Roasted Pork, Chilled Chicken Roulade with Sesame Marinated Jellyfish, Drunken Prawn with Chinese Herb. Good starter. I liked the chilled chicken roulade - it's a bit like "pak cham kai" (白斩鸡?) but served as a thick, moist roll. 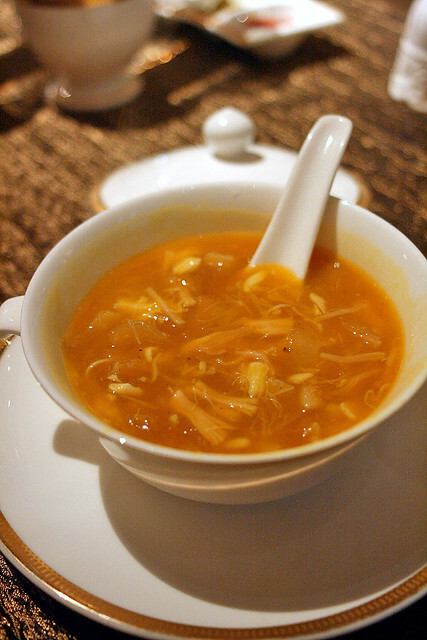 Pumpkin Superior Broth with Shark's Fin, Crab Meat and Dried Scallop - a hearty bowl with generous ingredients! 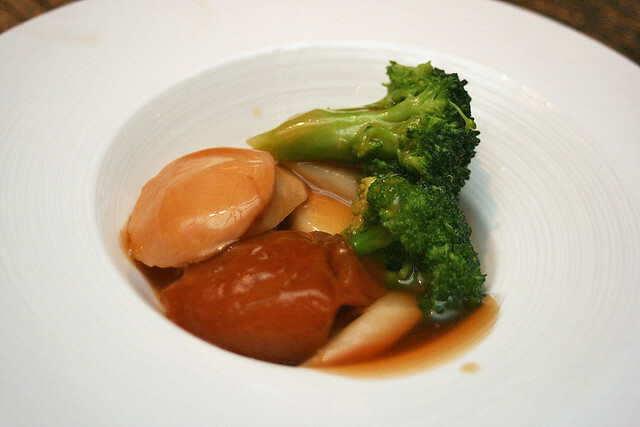 Braised Sliced Abalone with Sea Cucumber, Broccoli and White Asparagus. Each of these must have been cooked separately (different cooking times required!). The stock used is pretty good. 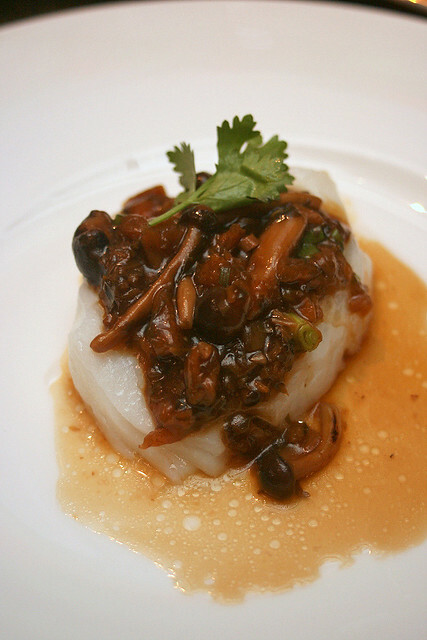 Steamed Cod Fillet with Shimeji Mushroom and Preserved Vegetable (mei cai). The fish is firm and fresh, and not overcooked. The toppings although salty, complemented the sweetness of the cod. Baked Chinese Angelica Marinated Kurobuta Pork. They sure didn't stint on the angelica! 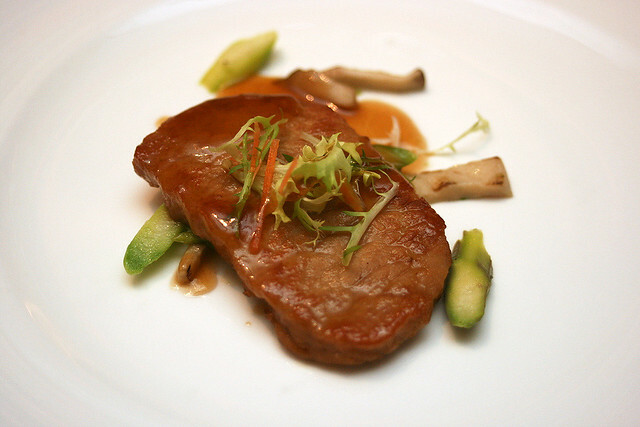 The pork may have been better off flash-seared on high heat to seal in the famously fatty juices. I love ee-fu noodles, so this was an instant winner for me. It was also good in that it wasn't soggy or mushy. Chilled double-boiled Lotus Seeds with White Fungus in Thai Young Coconut. The evening ended very well with this dessert. 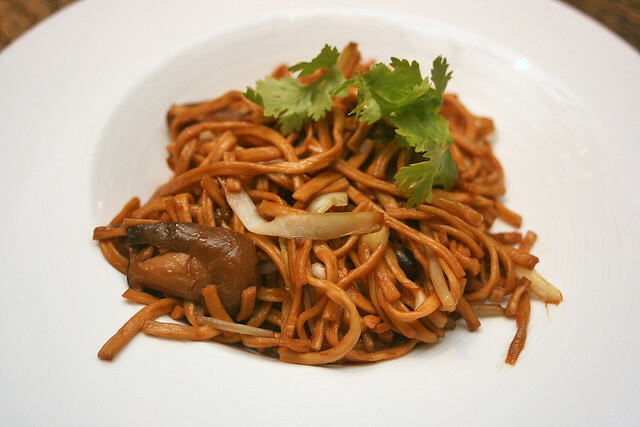 Loved the crunchy white fungus. 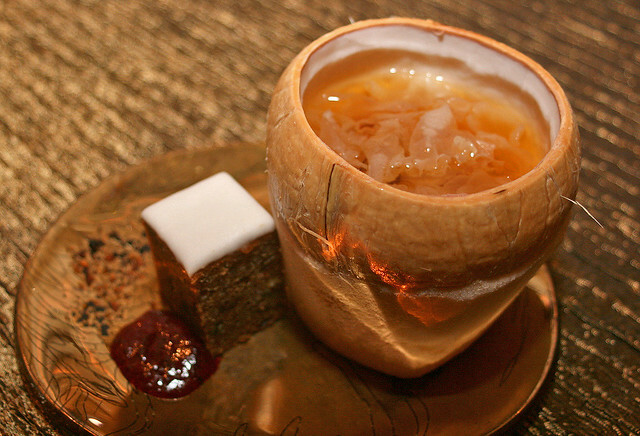 And it's such a delight scooping the tender coconut flesh right into the dried longan-infused brew. I never knew this combination could work so well! There was a cube of wedding cake too, an intense fruitcake paired marvellously with tart berry jam. We enjoyed the entertaining programme, the photos and the videos. Thanks, Tess and Ryan, for inviting us to your wedding. You have our most heartfelt congratulations! Indeed, how do you measure love? 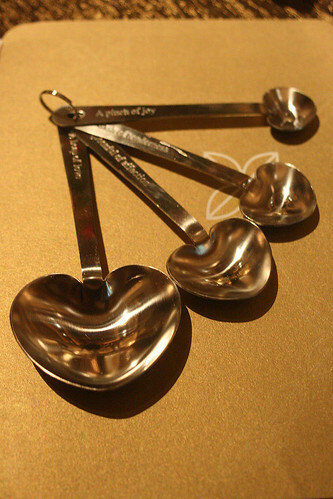 :) These measuring spoons are such a playful take on that. Yeah gotta say those measuring spoons are a nice idea!